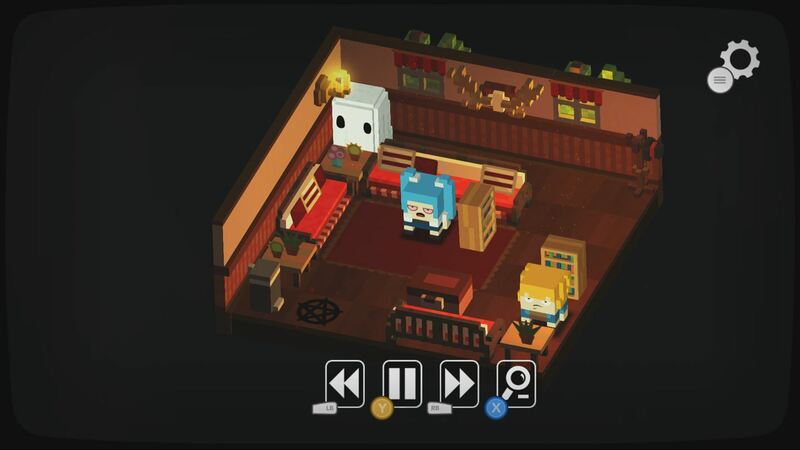 Welcome to Slayaway Camp: Butcher’s Cut, a sliding puzzle game that is themed around the player controlling the serial killer in a horror film. You must slide your character and try to kill civilians, whilst ensuring that you hit them in the right order so you can actually exit the map by stepping on the floor symbol. The ‘films’ that you take part in ramp up in difficulty, introducing new mechanics, such as cats, water, mines, and fires, along with a few other obstacles that come along. There does however seem to be only one way to solve each level – generally a blatantly, obvious way. Thing is, there are well over 300 puzzles that you can solve and slay your way through, but they all start to feel like they fall on the dull and uninteresting side of puzzles. As I got myself closer to the halfway point of Slayaway Camp: Butcher’s Cut, I couldn’t really note if the game was throwing anything new at me. It’s very much like a book of sudoku, but instead of delivering new combinations and larger puzzles, Slayaway Camp decides to swap one or two numbers, just to give some ‘variety’. If the team at Blue Wizard Digital had spent more time on making puzzles that were a bit more interesting, and that took more than a second of thought, instead of trying to squeeze in as many as they could in order to boast about containing over 300, then things may have been a bit different. To add, the game also contains its DLC in this Butcher’s Cut version, which just adds more of these puzzles to get through. They’re themed to be something different, but they might as well just be reskins of other puzzles. 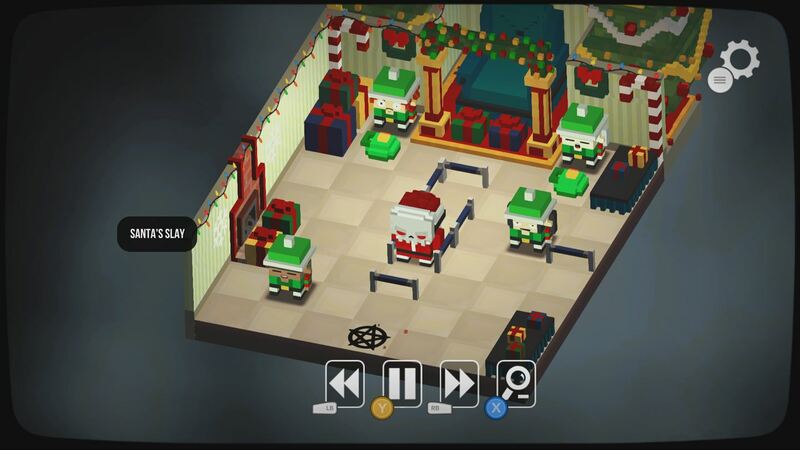 Nothing in Slayaway Camp is ever too puzzling or really intriguing, and the only time I felt the need to purchase the step by step answer was to see if it actually worked in giving you the proper answer. Thankfully, it does, so anybody who wants to utilise that function will have no issues with it. The issue that does arise from this however, is in the currency that you spend. You see, there are coins in Slayaway Camp, a currency gained by completing extra kills after each level; a process which simply involves you pressing ‘A’ whenever an arrow is in a red boundary on a sliding bar. You can spend these coins on buying new Killer skins, each of which cost a whopping 1000 coins and act as a mystery loot bag, and you can also buy new murder animations. The murder animation packs vary in price, with the more gruesome ones being more expensive. Aside from the cosmetic value of these coins, they can also be used to purchase hints and solutions to solve a level that might be giving you trouble, costing 125 for each solution, 25 of which being used to buy the tip first. You will have to grind movies in order to get enough money to purchase all of the killer skins, and to buy all of the murder packs. Thankfully, if you do end up buying the solutions to a level, you’ll definitely be able to grind that mission for more coins, you might even make back the cost of the solution in a couple of runs! These new killers are all just cosmetics, similar to the characters in Crossy Road. Many of them look like they might as well have been part of that mobile game, and you have to start the campaign before you apply the cosmetic, otherwise you will end up defaulting back to the original killer’s skin. Most of them are satires of other, much more interesting killers, such as THAT instead of IT, and it just ends up reminding you of better times spent watching a movie, then it does in poking fun at the characters themselves. That being said, you can’t really see a list of all of these killers. They don’t appear visible, so you have to grind some coins in order to buy mystery boxes to purchase more of these characters, just to see if they were worth it in the first place. You can also purchase new kill packs, which are more of those post-mission kill cutscenes that don’t really fit the over the top feel that is promised in the brochure. 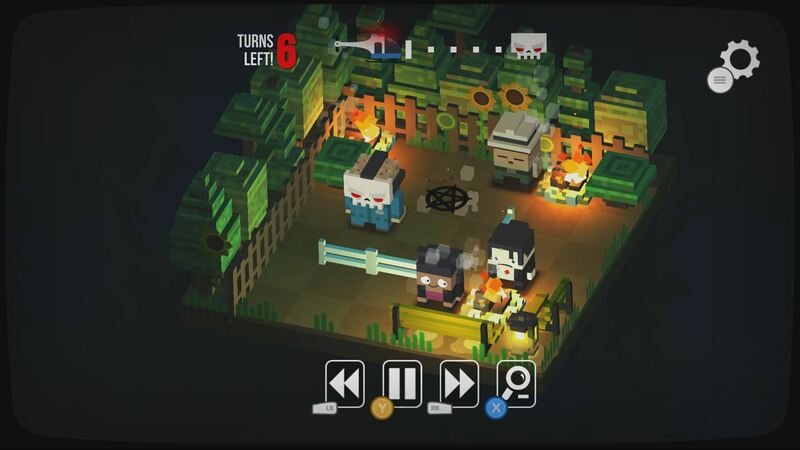 Slayaway Camp: Butcher’s Cut seems to sell itself on the concept of a game that is supposed to be ridiculously violent and completely out of the comfort zone for most. But, because of the aesthetic of the game, you don’t really get that slasher flick vibe, instead leaving it to feel more like a bland attempt at being gory and mundane. There is also a suspicious option called ‘Killer Kodes’ in the options screen, which makes me feel like either promotional codes or microtransactions were present in this game prior to it being moved to the Xbox One. The low payout of coins for each movie seems to support the idea of microtransactions being present previously, and that certainly vexes me something fierce. Now, you may have an inkling already of what this game was before it came to the Xbox One in its Butcher’s Cut guise, and I’m here to tell you your suspicions are, in fact, correct. It was a mobile game, one that was ported to the PC afterwards, and then to our lovely little black box. That usually means that you’re going to get subpar graphics, and some spotty framerates that can be quite vexxing to some gamers. Unfortunately, this game hasn’t managed to dodge that magical bullet. 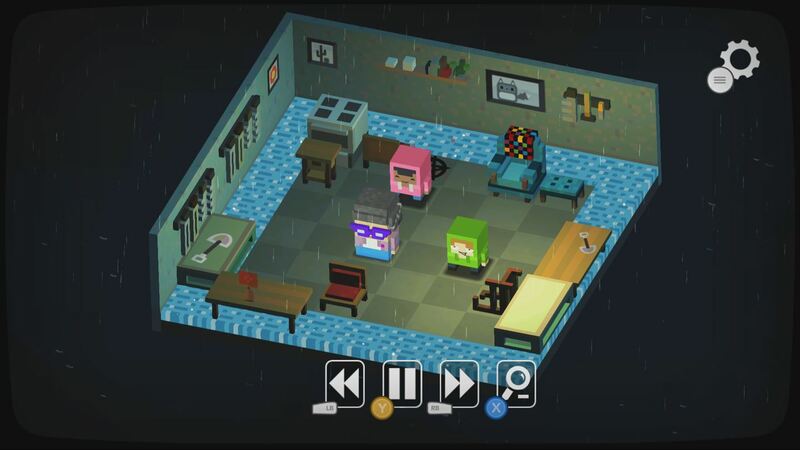 The characters are all designed in the same way the characters of Crossy Road are designed, and you’ll often experience significant slowdowns when you unlock the exit for the level. The particle effects seem to kill the game, which is a bit fitting, what with you playing as a killer from a slasher flick. The audio of Slayaway Camp is also a tool for a murderer. The screams of the dying characters nearly sent my cat into a flurry of claws and fangs. I had to dodge the incoming Cat-maggedeon as I leapt to turn off the volume of the television, and then I heard another scream that sounded like somebody screaming into a tin can whilst they recorded the clip. It was at that point that I realised just how much it hurt my cat’s ears, and just how much I wish the voices would stop screaming. So, if you’re an individual with animals that are sensitive of hearing, like cats, bats, or… rats, I guess it’s best to make sure you turn down or silence your game. If you have tinnitus like I do, then just mute the game. 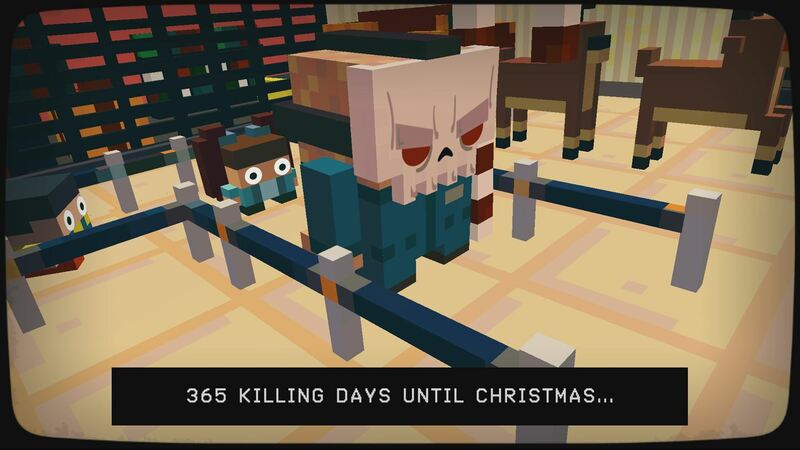 Really, you’d hope for more out of Slayaway Camp Butcher’s Cut. Each of the films are making fun of the general slasher flick, and the narration at the start of each grows seemingly more uninterested and depressed, much like the plots of these films, as the series continues. You can tell the game is a satire, but unintentionally, it runs out of ideas as you progress through the stories. Each level just feels like another dull slaughter, followed by more slaughters of equally dull proportions. It just doesn’t have anything that will keep your interest for more than a couple of hours before you feel like smacking your head against the wall in boredom. But that said, Slayaway Camp: Butcher’s Cut is decent overall, and probably would have a lot of potential in the right hands. Whether it sits in those hands is not for me to judge, but I am reasonably sceptical of such a concept. If you’re looking for a slasher-based game, then there’s that Friday the 13th game that you may have heard about. If you’re looking for a puzzle game, buy a sudoku book or a jigsaw puzzle. If you’re looking for something that combines puzzles and slasher films, then this is just about a decent holdover until something better comes along.